Go: Ichiryusai, Ichiyusai, Ryusai, Tokaido Utashige. Ukiyo-e painter, printmaker. Lived in Edo; son of an official of the fire department assigned to Edo Castle. Early interest in art, his first teacher Okajima Rinsai; then tried unsuccessfully to enter Utagawa Toyokuni’s studio; at about 14 became a pupil of Utagawa Toyohiro. Also studied nanga painting under Ooka Umpo; interested in Western art and the work of the Shijo school. Gave up his hereditary position in the fire department to his son, leaving himself free to devote himself to painting and designing prints. 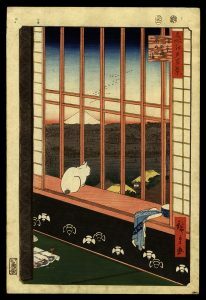 In 1812, took name of Hiroshige. 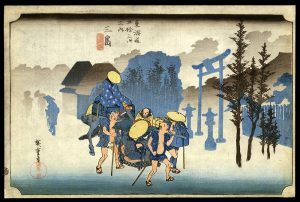 His first published work, in the field of book illustration, dates from 1818; during the following decade Hiroshige published capable work in the field of figure prints: actors, warriors and girls. 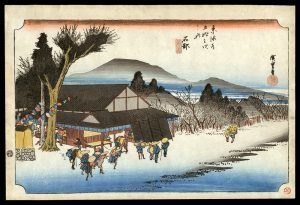 From the year 1831 he began (under the influence of the great Hokusai) the series of landscape prints that were to make his name: Fifty-three Stations of the Tokaido, and later Famous Views of Japan, Famous Views of Kyoto, Eight Views of Lake Biwa, Sixty-nine Stations of the Kiso Highway. Through not the prodigious eccentric that Hokusai was, Hiroshige nevertheless made a large contribution to the development of the landscape print, as well as to the field of flower-and-bird prints (these revealing his inclination toward the Kyoto Shijo School more than toward ukiyo-e). 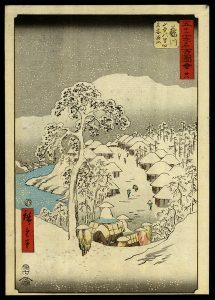 In effect, Hiroshige consolidated the landscape form and adapted it to popular taste, thereby diffusing the form to all strata of society. But eventually this also led to overproduction and declining standards of quality. At his best, however, Hiroshige was a master of the impressionist, poetic view of nature, and he remains the best-loved of all Japanese artists. 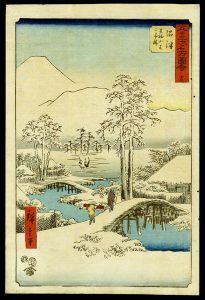 Among his pupils were Hiroshige II, Shigekatsu, Shigekiyo and Hiroshige III. Taken in whole, or in part from: Roberts, Laurance P. A Dictionary of Japanese Artists: Painting, Sculpture, Ceramics, Prints, Lacquer. Weatherhill, Inc: New York. 1986.